Vík í Mýdral is the most southern village in Iceland. It’s located at Iceland’s ringroad, so you will pass Vik on your way south and east. For many travellers it’s just a quick stop on their way, but beach lovers should take their time here to explore two beautiful black beaches. Even with rain and storm it’s worthwhile to visit the beaches. 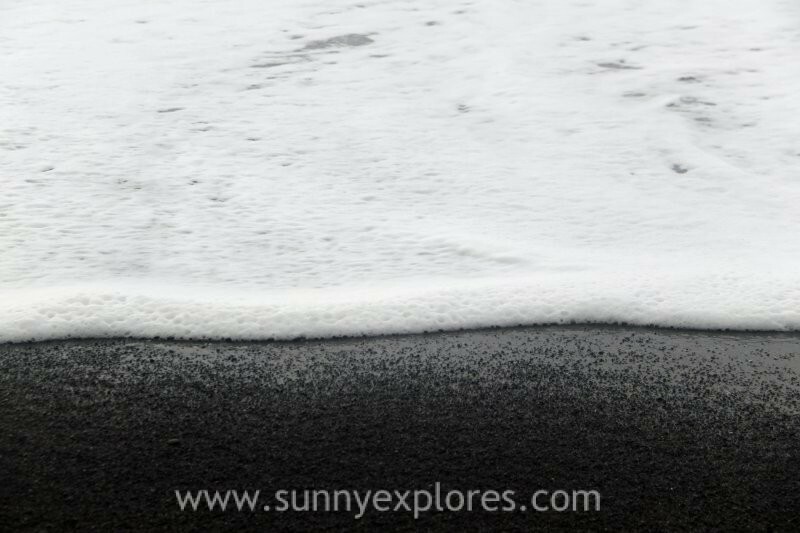 The black sand in combination with the wild, rugged landscape will turn your world in a black-and-white adventure. Dyrhólaey Peninsula is famous for the stunning views of Iceland’s south coast. Dyrhólaey’s iconic huge black arch of lava with a hole in it, gave its name to the whole peninsula. Dyrhólaey means ‘Door Hill Island’. The peninsula is of volcanic origin and was once an island before joining up to the Icelandic mainland. In ancient times, passing sailors used to refer to Dyrhólaey as ‘Cape Portland’. Nowadays it’s a popular place for birdwatching. The cliffs and enormous rock arch are nesting places for puffins and other birds. The rock arch is also called Dyrhólaey. This natural arch is a result of centuries of erosion. On top of Dyrhólaey stands Dyrhólaeyjarviti, a beautiful old lighthouse. The first lighthouse in the area was built in 1919, the current construction was completed in 1927. The view is amazing. In the south you see the famous arch, in the north you can see the Mýrdalsjökull glacier, in the east you have a great view on Reynisdrangar, while in the west an endless black coast seems to stretch till eternity. 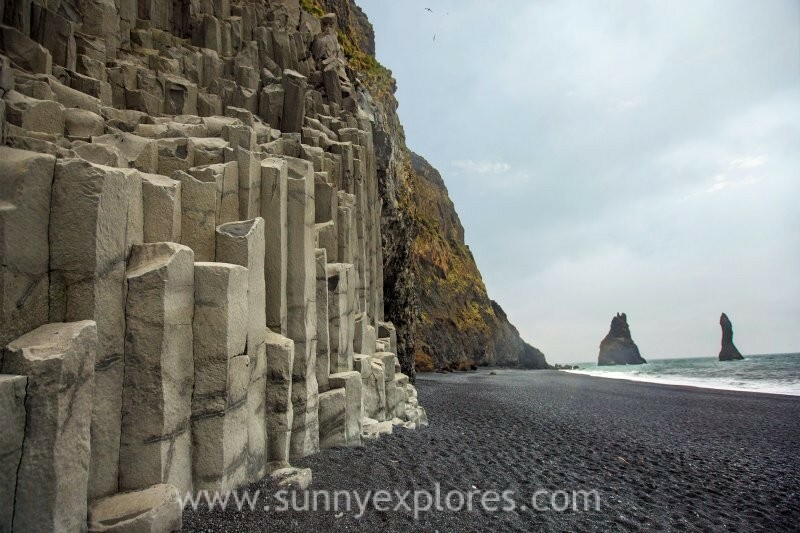 Reynisfjara is Iceland’s most famous black sand beach. 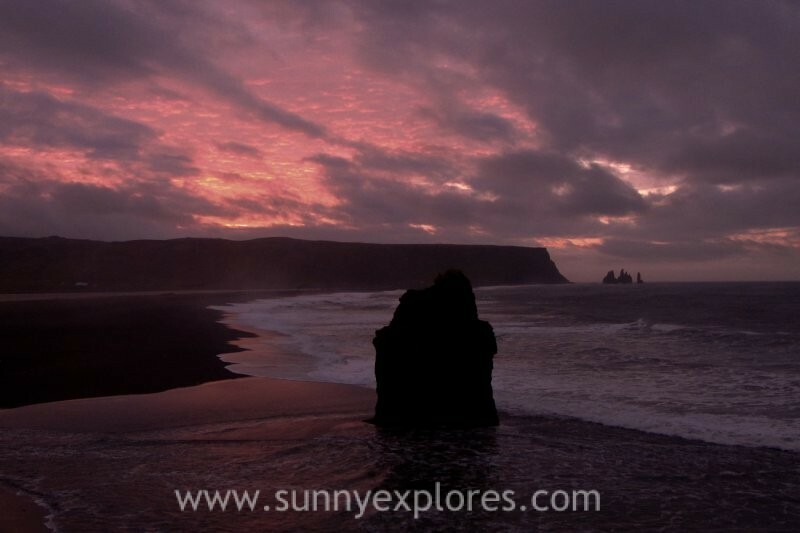 In 1991, National Geographic voted Reynisfjara as one of the Top 10 non-tropical beaches to visit on the planet. It’s a special place with enormous basalt stacks, roaring Atlantic waves and stunning panoramas, Walking on the beach, you will immediately see rocky sea stacks sitting off the shoreline. According to local stories the Reynisdrangaer sea-stacks are two frozen trolls. Centuries ago two trolls saw a ship out by night. They waded out to reach it. They got hold of the ship, and began to drag it to the shore. But before they reached land, the dawn broke. The trolls were instantly frozen into stone, and they have remained immortalised ever since. 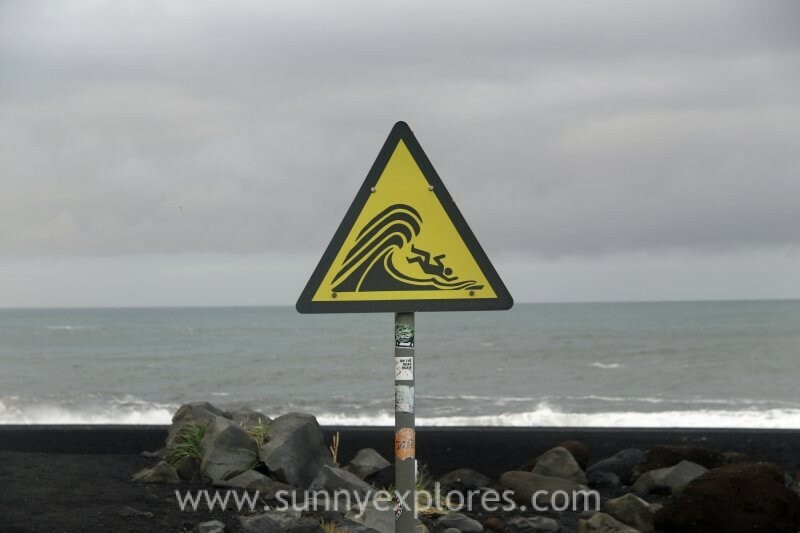 Reynisfjara is beautiful, but be careful when you visit this beach. It is gaining a notorious reputation for its sneaker waves. The rolling, roaring waves of Reynisfjara are particularly violent, often pushing far further up the beach than you would expect. These are called sneaker waves, and they can appear when least expected, even on incredibly calm days. There are no significant landmasses between Antarctica and Reynisfjara, which gives the waves the entire length of the Atlantic Ocean to build strength. 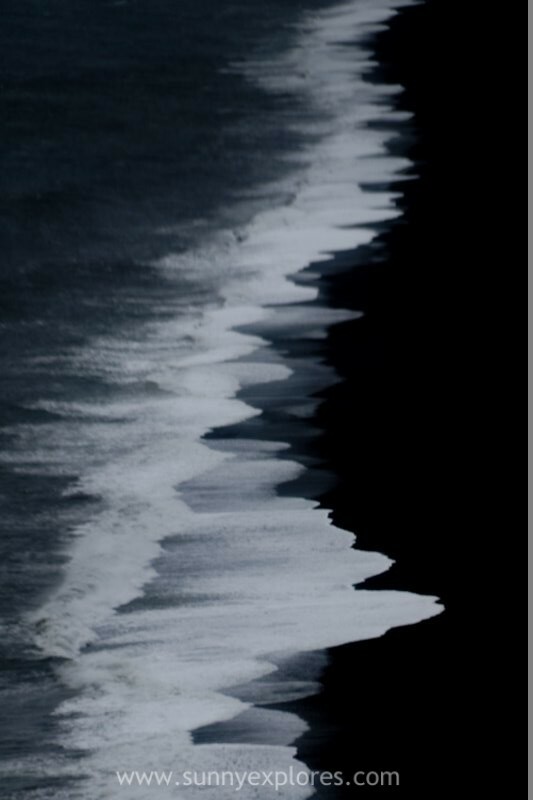 This means that even on still, summer days, they can rise from seemingly nowhere and chase far further up the sand than would ever be expected. It is important to never turn your back on the waves and to stay at least 30 metres from the water’s edge. Aside from these sudden and dramatic shifts in tide, the rip currents offshore are infamous for their strength and ability to drag people out into the freezing cold open ocean. A number of fatal accidents have occurred at Reynisfjara. Most visitors will only see the Reynisfjara sea-stacks from the shore of Reynisfjara, although there is an incredibly rewarding view of them from above. 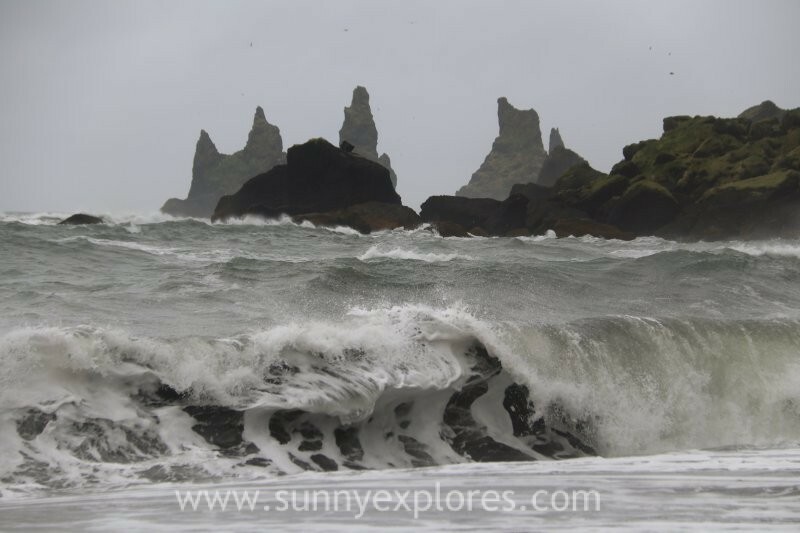 It worth to venture up the cliffs of Mount Reynisfjall, by a road to the west of Vík. The mountain holds thousands of puffins every summer, from May to August. You can also see Arctic sterns, fulmars and seagulls on the cliff. And when you are really lucky, you may even see seals, whales and dolphins in the water. 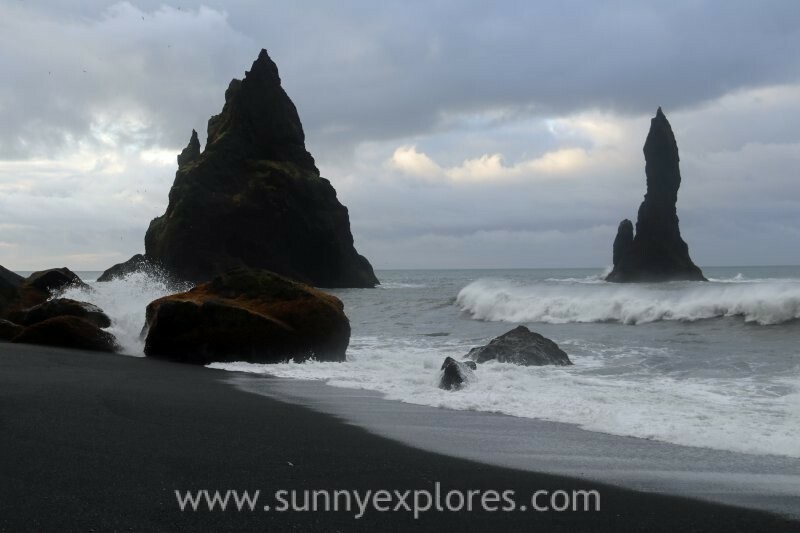 Vik black sand beach offers a view from another angle, as wel als Dyrhólaey cliffs. You can see the stacks from all sides.